There is a significant level of improvement in the implementation of proposals pertaining to the reorganization of UNP, says State Minister of Irrigation and Water Resources and Disaster Management Palitha Range Bandra. He points out that, the manner in which the relevant proposals have been implemented so far is satisfactory and there is an awakening within the village-level supporters regarding these reforms. The struggle within UNP for the future of the party and its supporters is gradually becoming a reality, added the State Minister. 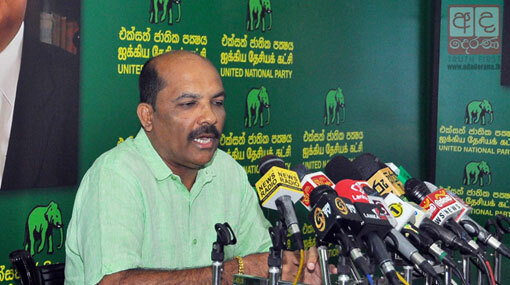 Range Bandara made these comments yesterday (02), joining a meeting held at the Anamaduwa UNP office. He charged that the ‘Pohottuwa’ (flower bud) is engaged in an attempt to “pawn” off the country’s people in order to quench their thirst for power. He emphasized that the UNP, under no circumstances, would allow a debt-ridden era again, that is full of fear and suspense, and that the recurrence of ‘white van culture’ is unanimously rejected by the public now. It is the responsibility of the public to wisely choose a qualified leader in 2020, and UNP is the best setting available for this, he added.